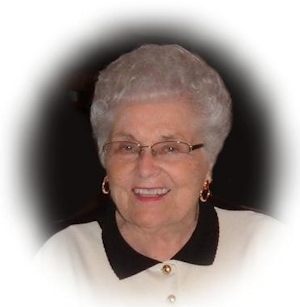 Obituary – Bowers, Dorothy Mae Anna (Grundeman) « Perry High School Alumni Association, Inc.
Dorothy Mae Anna Bowers, 86, of Perry, Oklahoma was the daughter of Henry Theodore and Martha Helen Baetz Grundeman. She was born October 27, 1925 in Perry and died on Thursday, February 9, 2012 at Perry Memorial Hospital. Dorothy was baptized at the Christ Lutheran Church on November 29, 1925 and attended the Christ Lutheran parochial school through the 8th grade. She was confirmed in her faith on April 2, 1939. 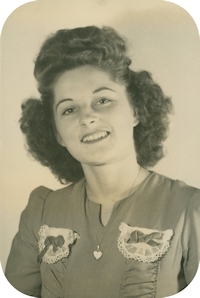 After attending Perry High School and graduating in 1943 she was hired at the Selective Service where she processed the paperwork for Noble County’s young men who were inducted into military service during World War II. At the end of the war Dorothy began working at the Perry Daily Journal as society editor and selling advertising. On March 30, 1947 she married Morris “Moke” L. Bowers. To this union was born two daughters, Cheryl and Joy. Morris and Dorothy lived their entire lives in Perry, Oklahoma. Moke spent many years selling candy and tobacco while Dorothy was busy as a homemaker and involved in all her children’s activities. In September, 1965, she and her husband, Morris, purchased a drivein and cafe, which they operated for three years, selling it in September, 1968. Dorothy then returned to work at the Perry Daily Journal. Morris started his own candy and tobacco business called Bowers Sales Company. In 1974 Dorothy and Moke semiretired and became involved with raising cattle on the family farm and selling advertising specialties. Dorothy had an artistic bent and renewed an interest in oil painting during these years. Her lifelong passion was the creation of a photo history of the family. As a couple, Dorothy and Moke enjoyed dancing, fishing, traveling and playing cards with family and friends. One of the highlights of Dorothy’s life was spending time with the grandsons. Dorothy was a lifelong member of Christ Lutheran Church. She taught Sunday school and Vacation Bible School for many years, was a member of the Unit 3 Lutheran Women’s Missionary League and had a heart for evangelism. Funeral services will be 10:00 am, Saturday, February 11, 2012, at Christ Lutheran Church in Perry, Oklahoma. Rev. William Metz will officiate. Services are under the direction of BrownDugger Funeral Home. Memorial contributions may be made to the Christ Lutheran Church or the Oklahoma Medical Research Foundation in care of BrownDugger Funeral Home, 1010 N. 7th Street, Perry, Oklahoma 73077. Dorothy is survived by two daughters, Cheryl DeJager, and her husband Bill, of Perry, Oklahoma and Joy Adler, and her husband Clint, of Stillwater, Oklahoma and two grandsons, Wade DeJager of Norman, Oklahoma and Michael DeJager of Denver, Colorado. She was preceded in death by her husband, Morris Bowers and her parents, Henry and Martha Grundeman.